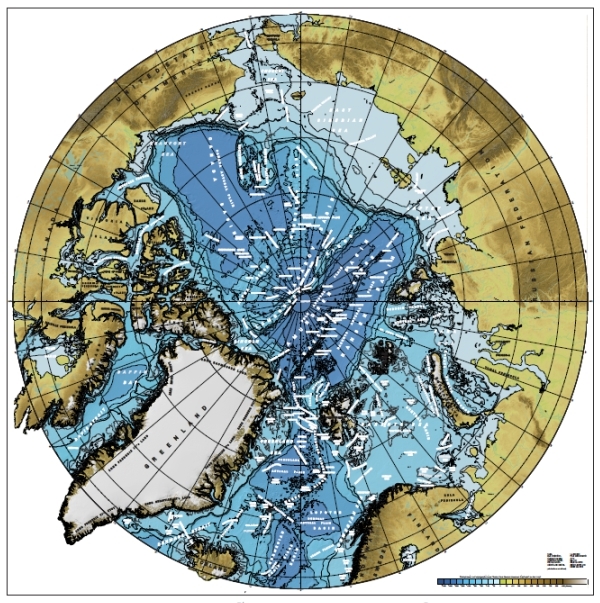 The goal of the International Bathymetric Chart of the Arctic Ocean (IBCAO) initiative is to develop a digital database that contains all available bathymetric data north of 64° North. From this database a gridded bathymetry data set has been developed for use by map makers, researchers and all who need a detailed and accurate knowledge of the depth and shape of the Arctic seabed. Version 3.0 of the IBCAO is now available to download from the IBCAO web site along with geo-referenced images. This release represents the largest improvement to the data set since 1999. It includes new bathymetric data from a number of sources, such as the circum-Arctic nations, fishing vessels, US Navy submarines and research ships from various nations. Click here to view an image showing the detail in the data set for a sample region off Norway. The IBCAO was initiated in 1997 and has so far involved the volunteer efforts of investigators from 24 institutions in 10 countries. Further details about the development of the grid and the organisations involved can be found on the IBCAO web site. The GEBCO Interim Sub-Committee on Regional Undersea Mapping (ISCRUM) aims to build a close collaboration with regional mapping efforts and coordinate and encourage the incorporation of their compilations into GEBCO. Previous releases of the IBCAO have made a significant contribution to GEBCO's global gridded bathymetric data sets. It is planned to include version 3.0 of the IBCAO data set in the next GEBCO grid release. Access a printable version of the International Bathymetric Chart of the Southern Ocean (IBCSO) in PDF form along with Geotiff versions of the data set. Version 1.0 of the International Bathymetric Chart of the Southern Ocean (IBCSO) is now available. Find out more about the IBCSO; how to access the data set and GEBCO's involvement in regional mapping activities.